The Belarusian authorities have demonstrated interest in improving relations with the EU. Due to stalled negotiations with the Kremlin, Minsk would like to reopen a window of opportunity for cooperation with Brussels However President Lukashenko is not ready to fully meet EU conditions – to release and rehabilitate the political prisoners. The Belarusian delegation at the Eastern Partnership Summit, headed by Foreign Minister Vladimir Makey, expressed a wish to attend to Belarusian-European relations. Makey informed the EU about the country’s desire to start visa facilitation talks with the EU, and, as in the past, Belarus also expressed interest in developing Belarus – EU economic relations. Meanwhile, Minsk is not striving to restore political relations. Makey emphasized that Belarusian authorities were ready to release the political prisoners, but under the condition that the prisoners appeal for clemency. This would allow president Lukashenko to save face and take the issue of rehabilitation of political prisoners off the agenda. Bearing in mind the apparent EU failure with Ukraine and Armenia, and Azerbaijan’s U-turn towards Russia, Minsk hopes for changes in Brussels’ approach to the Eastern Partnership countries including Belarus. But Belarus has no plans to conduct structural economic reforms in the short or medium term and therefore is not considering possibilities to receive assistance from the EU. Top-level authorities virtually have no interest in the Eastern Partnership Programme. Belarus’ readiness to start visa facilitation talks should be interpreted as an attempt to outline the framework of a potential agenda for Belarus-EU dialogue. Makey said that he had received those guidelines directly from the president, “He [the president] acted on the premise that it would be for the benefit of Belarusian citizens, our people. And it will be taken very positively by them”. That the Belarusian authorities expressed interest in visa facilitation talks does not necessarily imply that the problem will be resolved in the near future. 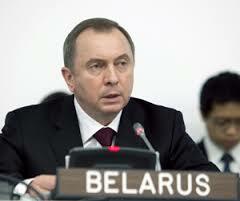 Belarus’ main task is to engage Brussels in negotiations. In fact, due to growing economic imbalances, simplification of the visa regime could have a negative impact on Belarus’ currency market. In September 2013, Lukashenko expressed concerns about Belarusians traveling abroad, “three billion dollars have been taken out, they develop trade, production, and we are floundering here like fools”. In addition, ahead of his visit to Vilnius, Makey talked about Belarus’ desire to review the agreement on visa-free border traffic with Latvia. Belarus hopes the EU will soften its requirements and will review approaches towards Belarus, particularly following the EU failure to sign Association agreements with some post-Soviet countries. Meanwhile, visa facilitation negotiations may drag on.